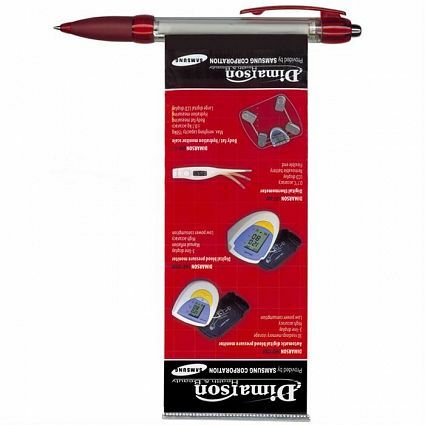 Retractable plastic ball pen with a soft rubber grip and a unique spring loaded, pull out flag which can be printed on both sides. Has a TRENDS Blue or Black ink refill with 800 metres of German manufactured DOKUMENTAL ink and a tungsten carbide ball for improved writing quality. Only available on indent for a minimum of 1000pcs. 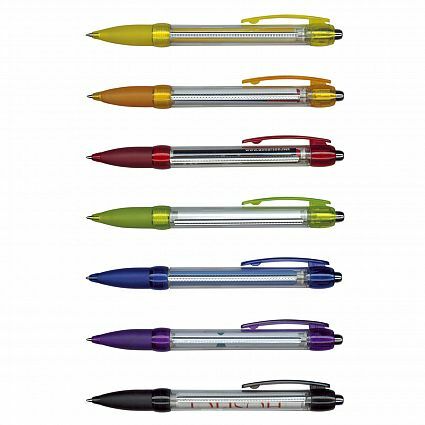 Clear/Translucent Yellow, Clear/Translucent Orange, Clear/Translucent Red, Clear/Translucent Bright Green, Clear/Translucent Blue, Clear/Translucent Purple, Clear/Translucent Black. Dia 13mm x L 146mm x 16.5mm (includes clip). Screen Print: Positions E & K – 50mm x 7mm. Offset Print: 68mm x 180mm. Available on indent with printing for a minimum of 1000 pcs. Indent printing areas may vary from those illustrated.